Please distinguish between this Steve Erickson (1950-____), author of Days Between Stations, and Steven Erikson (1959-____), author of Gardens of the Moon. Thank you. 「文芸フェスイベント Monkey Business(英語版) presents スティーヴ・エリクソン 自作を語る 」 現代アメリカ最重要作家が自作を語ります!! 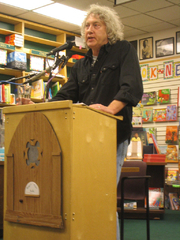 Steve Erickson is currently considered a "single author." If one or more works are by a distinct, homonymous authors, go ahead and split the author. Steve Erickson is composed of 4 names. You can examine and separate out names.